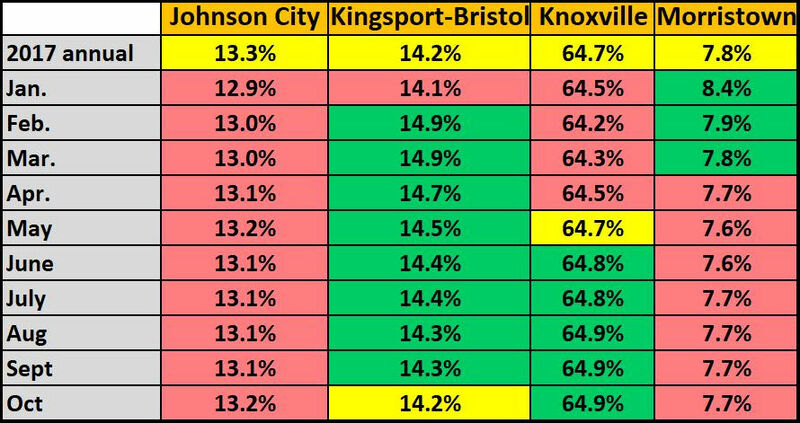 The Johnson City metro area had the best retail sales collection performance in Northeast Tennessee in October. It was the third straight monthly year-over-year increase for the three-county Metropolitan Statistical District (MSA) which has underperformed its regional market share every month this year. October’s seasonally adjusted Johnson City collections were also second to Nashville which led the state with a 5.2% increase. Statewide collections were up 3.6%. 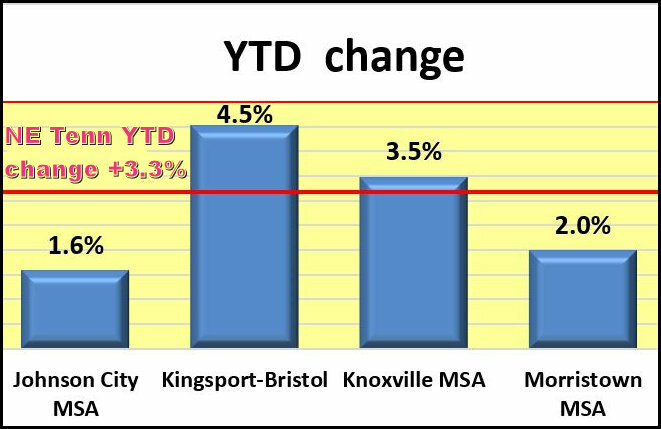 Kingsport-Bristol continued to lead the region in year-to-date collections improvements compared to the first 10 months of last year. It also has the best record of collections performing above it 2017 market share position. Clicking on the charts renders larger versions. Statewide collections were down 2.7% from September. Each of the state’s 10 metro areas was also negative. Sales tax collections were in contrast to October’s Tri-Cities labor market performance. Employers added 1,000 nonfarm jobs, the unemployment rate was 3.8% and the average hourly wage for private-sector workers was up in both the Johnson City and Kingsport-Bristol MSAs. According to preliminary numbers from the Bureau of Labor Statistics (BLS) the average hourly private sector wage increased 0.5% to $18.32 in the Kingsport-Bristol area. It was the seventh month-over-month increase for that four-county area. Private sectors workers in the Johnson City metro area increased by 1.9% to 20.31 – the best monthly increase since April.